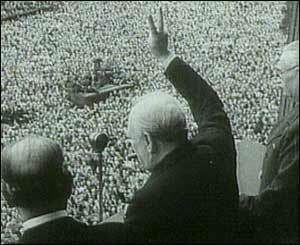 Millions poured on to the streets for joyous celebrations after Winston Churchill announced the German surrender and Victory in Europe on May 8th 1945. People played in the fountains in Trafalgar Square and rode on the tops of buses around London but Kevin Telfer pointed out in his highly informative talk – based on his latest book, Summer of 45 - that the following months, building up to Victory in Japan in August were a complicated period, full of continuing upheaval. Kevin appeared in Wootton exactly 70 years after VE Day and played us a recording of Winston Churchill’s momentous radio broadcast in which he announced the Nazi capitulation and signing of the armistice, He also showed us a photograph of him addressing vast crowds in central London, displaying the famous V for Victory with his right hand, although Kevin pointed out that Churchill had to be shown how to use it correctly – having previously given it the other (and slightly more offensive) way round, to the amusement of many people. He also played a recording of King George VI bravely addressing to the world on the radio following the armistice, despite his noticeable stammer. 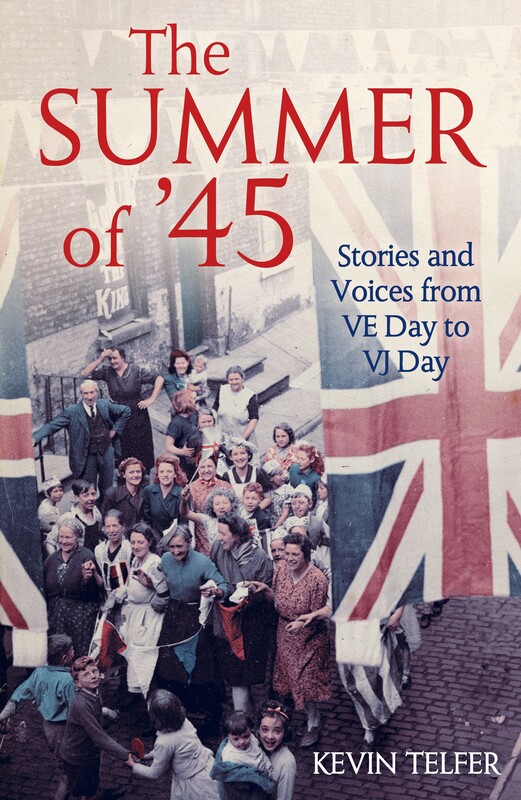 Kevin vividly brought to life the celebratory scenes around VE Day, reading ecstatic testimonies of people not only in London but also in other cities, such as Paris where the writer, Simone de Beauvoir, described the atmosphere following the German defeat and exit. Several million people were still stationed around the world when peace was announced and he quoted the diaries of a young Tony Benn who was sweltering in the heat of Palestine – where he and his comrades could still not quite believe that the news was true and yet indulged in a celebratory ice-cream..
Kevin also showed images of the celebrations in New York, where the iconic photograph was taken of a sailor embracing a (not entirely relaxed) woman – they were reunited many years later when the man confessed, rather sadly, that it was a drunken act. There were also rapturous scenes in Russia, which had lost 27 million people – the most of all the Allies – in fighting the Nazi military machine on the eastern-front and also during the taking of Berlin. However, amid all the rapture in May 1945, not everything went smoothly. Crowds in London were so vast that several people were killed in traffic accidents and thousands of homes were still in rubble following the Blitz – and many servicemen faced the prospect of returning home to a bombed-out house, uncertain job prospects and children who did not recognise them. 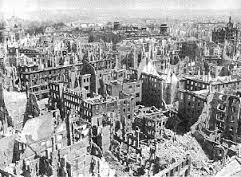 Kevin also highlighted the devastation of the vanquished, with a poignant photograph of the near-total destruction of Dresden and the melancholy image of a mother and child amid the desolate aftermath of the atom bombs dropped in August 1945, which triggered the Japanese surrender. 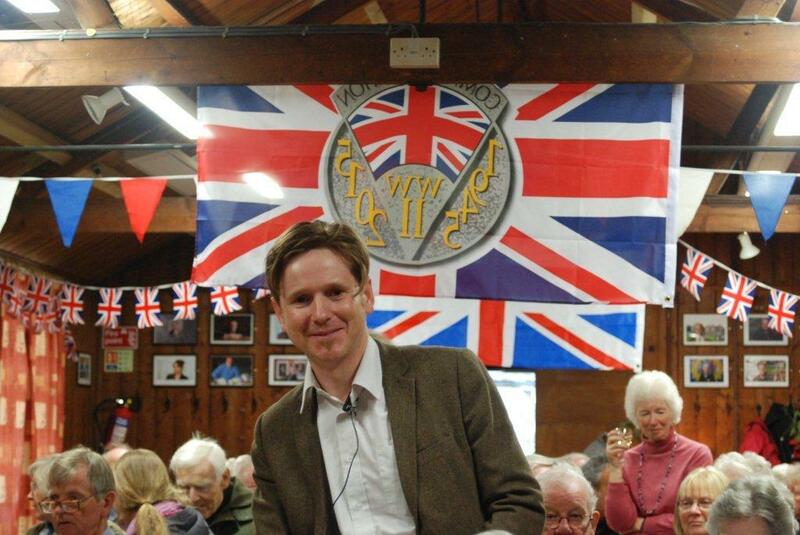 However, as a counterpoint – to show the tyranny the Allies had been fighting – Kevin highlighted the testimony of Richard Dimbleby, who was one of the first correspondents to enter the Nazi death-camps and witness the aftermath of all the barbarity, with corpses piled high (an experience that never left him throughout his life). In the UK, into the mix of uncertainty came the election called for July 1945 when Clement Atlee, leader of the Labour Party, defeated Churchill who, according to Kevin, fought a lacklustre campaign probably as a result of exhaustion following his Herculean efforts during the war. After all the energy expended over the previous six years, he seemed to experience a tangible anti-climax when touring the country.